Many people know Erling Kagge as one of the greatest adventurers of our time, but not everyone knows about his passion for collecting contemporary art. Read an interview and discover more. Kristina Kulakova: How did you come to collecting? 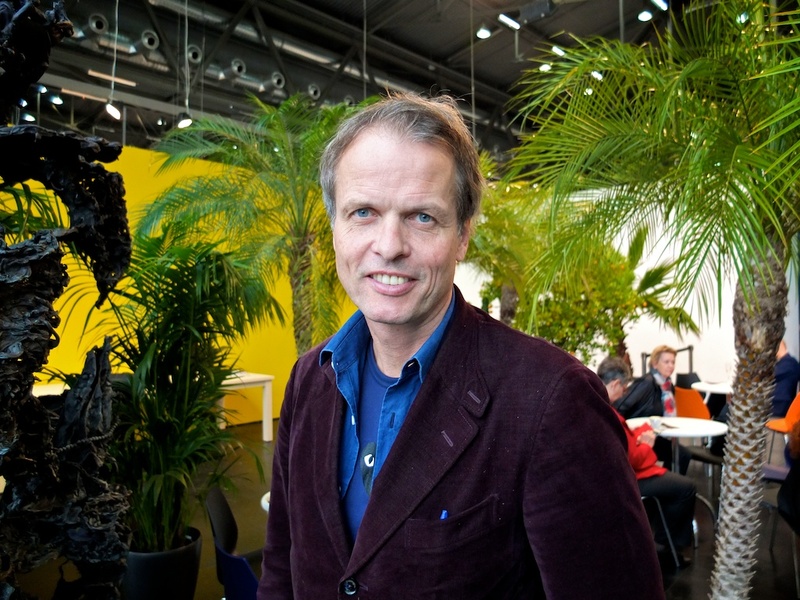 Erling Kagge: I’ve been into art since I was a little kid. My parents didn’t collect, and my brothers don’t collect, but somehow I was really interested in art from early on – in general I was very curious about everything. Twelve years ago I started to earn some good money and I had some time, so I began to travel around the world, to search for good art and buy it. KK: Did you study art? EK: I have a degree in Law and Philosophy; I think one doesn’t need an art degree in order to collect. I’ve developed some kind of taste through traveling, talking to people, and years of seeing. KK: What is important for a good taste? EK: Being close to good gallerists helps. Most important are galleries and gallerists you can trust, who show you the kind of art you like. KK: What are your favorite galleries? EK: There are several: Neu in Berlin, Standard in Oslo, Regen Projects in LA, Presenhuber in Zurich and several others. KK: Are you impulsive when it comes to buying an artwork? EK: Usually I make the decision whether to buy or not to buy right away. Sometimes I need time to think or some advice, but normally I make up my mind very quick. KK: What was the first piece you bought? EK: I bought a lithograph by a Norwegian artist when I was 20 years old, and I still have it because I am not fond of selling in general. And I understand why I bought it 30 years ago. I was lovesick. KK: So you never sold an artwork that you bought? EK: I am not found of selling. I like to collect. Sometimes however a part of the world gets crazy. I once bought a nurse painting by Richard Prince for USD 50 000 and four years later people were begging to buy it for several millions. I liked the work, but it was just too much money for me. Selling it allowed me to buy more works. KK: Have you ever said I’ve made a mistake in buying this artwork? I don’t want to have this any longer? EK: I never regret buying an artwork. But there were many pieces I should have bought, which I didn’t. I am however not good at regretting. KK: Which artists do you collect? EK: I focus on artists from Scandinavia, the US, and the German-speaking countries. I like Sergej Jensen because he has it all. His lineage includes Sigmar Polke, Kurt Schwitters, Blinky Palermo, and Robert Ryman. I was too late to begin collecting Franz West. Prices hiked too early, and I am not a rich man. But I have kept on collecting artists who have been influenced by his body of work, such as Matias Faldbakken, Gardar Einarsson, and Oscar Tuazon. Others I bought include Jan Christensen, Wolfgang Tillmans, Kirsten Pieroth, Klara Liden, Trisha Donelly, and Raymond Pettibon. KK: What about Eastern Europe? EK: I find Eastern Europe fascinating. I was born in ’63 and then had to wait for several decades before actually learning about what was happening in that part of the world. If you go to Romania you see that they did great things, they knew what was going on in the world, and they were influenced by the great international artists and made fantastic art. But unfortunately it was not seen in the West. But it’s changing, you know. It’s important to be humbled. KK: What does collecting mean to you? EK: For me collecting contemporary art is about exploration and trying to understand what is going on. I also collected Russian icons, which is a particular dimension in my life, but it is a different story. I am not exhibiting them for time being, but I used to; they are in a warehouse at the moment. One thing they have in common with contemporary art: They are kind of difficult to understand, and I like things to be complicated, I like things to be difficult. KK: What is your advice to young collectors? EK: Everyone will give you the same advice: see as much art as possible, read magazines and books, and try to make up your mind rather sooner than later. I think it took me a bit too long. You should explore and research, but you should also just start buying because the best way to learn how to collect is to start collecting. Then hang what you bought in your home or office and educate your own taste, which is very important. When it comes to contemporary art most people don’t have good taste. Tags: adventurer, Albert Schweitzer, Antarctica, artwork, Atlantic, Blinky Palermo, Borge Ousland, Cambridge University, Cape Horn, collecting contemporary art, eastern europe, Erling Kagge, Franz West, Gardar Einarsson, German-speaking artists, Jan Christensen, Kirsten Pieroth, Klara Liden, Kurt Schwitters, lithograph, Matias Faldbakken, Mt. Everest, neu, Norsk Hydro, Norwegian artist, nurse painting by Richard Prince, Oscar Tuazon, Presenhuber, Raymond Pettibon, Regen Projects, Richard Prince, Roald Amundsen, Robert Ryman, Romania, Russian icons, Scandinavian artist, Sergej Jensen, Sigmar Polke, Standard, Thor Heyerdahl, three poles, Time magazine, Trisha Donelly, University of Oslo, US artists, Wolfgang Tillmans. Bookmark the permalink. This was a very interesting article. Like Erling, I am an explorer as well. As a 44 year meditator … I explore inner space. I am a third generation Norwegian living in Houston Texas. My grandmother was born north of Oslo. What caught my eye … and caused me to respond to your article is Erling’s interest in philosophy. At St. Thomas University, in Houston, I majored in Art History and Studio Painting with a minor in Philosophy. I have shown in different museums in America and have international collectors of my work. My sensibilities are more European since I am not a fan of irony and sarcasm which is what a lot of American contemporary art is like. If you would like to see just how far into my personal exploration of abstraction has gone please go to my new unfinished website. I would love to communicate with Erling if he wishes.